I finished with a time of 1:35:57.1 (10:01 pace) and 198/271 overall. I finished 15th in my age group - no where near placing, but not dead last like I thought I'd be (did I mention it was raining cats and dogs?). He finished with a time of 1:13:32.6 (7:44 pace) and 38/271. He finished a close but not quite 4th in his age group. He's a little upset he didn't get 3rd in his age group because he knows he can run that fast, but I still love him. I'm very proud of him and frankly myself. Even now, knowing I can run 9.5 miles, I have no idea how I did it. So here's the story for those of you who don't know. Mr. H. and I are training to run a half marathon. We're scheduled to run it the last weekend of October, Sunday the 26. But here's the problem, there isn't a half marathon scheduled in Chicago, or any of the surrounding areas that weekend. So instead of waiting to find a half marathon to run in, you know, one fully supported with a certified course and all, we decided to do our own half marathon. Sounds like fun huh? Well it seems to be for my sister who has taken it upon herself to organize a course for us complete with water stops, t-shirts and medals at the end (if I'm running 13.1 miles, I better get some sort of medal). She's currently looking for volunteers for the water stops, and I'd love someone to run next to me the whole time to help me keep going or at least some friends along the route to clap and say good job. Let me know if you're available that weekend. Yesterday, Johnpaul, Jackie and I ran the Nike Human Race 10k. The race was held in more than 20 cities around the world. 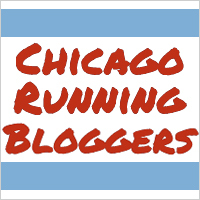 I'm not sure exactly how many people did the race worldwide, I heard a million, and I think about 16,000 ran it in Chicago. I finished in 108,636 place in the world, 5,921 in Chicago, and in 2,626 place out of the Chicago women with a time of 1:03:15. Not my best 10k time, but not too bad considering how many people were running. It was fun getting there, because pretty much once we left our apartment to walk to the train we saw people wearing the run t-shirts. The shirts, as you can see from Jackie's, also had our bib number on them - so everyone was wearing them. It was cool to see all the people on the train heading toward Soldier Field for the race. However, it was near impossible to keep track of Jackie as I ran and we eventually lost each other around mile 3. For this reason only she finished two minutes in front of me.